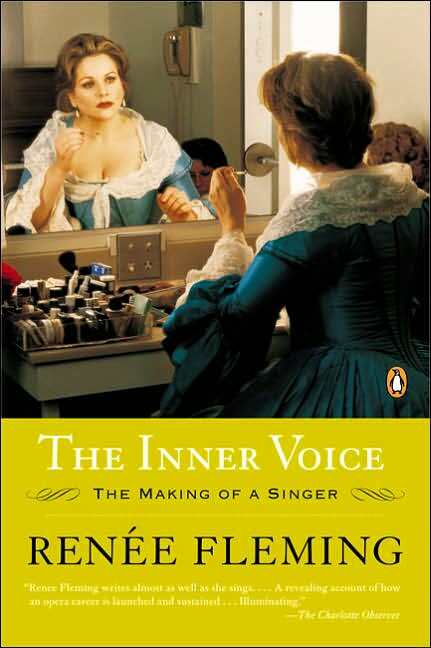 On my recent field trip to Daedalus Books, I picked up Renee Fleming’s book The Inner Voice: The Making of a Singer for $4.98. Considering I almost paid the full $24.95 list price when it first came out, I considered this to be quite a bargain. Miss Fleming (or “Double Creme” if you believe Sir Georg Solti’s nickname for her) is not really my cup of tea these days, but having seriously studied voice as an undergraduate I was intrigued by the book nonetheless. This is not your typical Diva autobiography. Encouraged by her friend, the insanely wonderful writer, Ann Patchett, Fleming wrote a book that is about all of those things that are left out of gossipy Divagraphies. She talks about the everyday life of an opera singer, from vocal technique to business management. The book was interesting for what it was, but I couldn’t help but wish for a little more gossip or at least a few more peeks at her famous diva friends and colleagues. Despite the overly cautious, slightly boring “how to” quality that pervades The Inner Voice, reading it encouraged me to reconsider my dislike for Miss Double Creme’s singing. She is the toast of the singing world after all and has lots of fans (including the lovely Ms Patchett who fashioned the heroine of her novel Bel Canto with Fleming’s voice in mind). After finishing the book I popped in the one Fleming disk that I own (“Renee Fleming By Request”) and listened to her sing “E strano…” from La Traviata to see if maybe I had been wrong in my opinion of her singing. I actually had a hard time listening to the entire track. She puts so much color and emotion into every single note that she sounds like an overblown caricature of an opera singer. Like someone with a good voice pretending to be an opera singer. A couple of years ago, before I had developed a dislike for Fleming, I heard her in a recital of french songs with the mezzo soprano Susan Graham at the Kennedy Center. All I could think that night was how much better Graham was. At the time I felt like there must be something wrong with me, after all Fleming was a much bigger star. But with every set they sang I couldn’t help but conclude that Graham was by far the better voice and the better artist. Still, it wasn’t until I saw a Fleming Christmas special taped in some church in Germany that I really began to dislike La Fleming. My main beef was not with the quality of her voice, but rather with her seemingly uncontrollable need to emote and emote and emote so that every note is so dripping with bathos it makes your teeth hurt. I don’t think “O Holy Night” is supposed to sound like a love song–divine love perhaps–but not a “hey baby I will literally die if you don’t come over here and make love to me” kind of love. It’s not Wagner’s Liebestod after all. In fact I don’t even want to hear the Liebestod with that much schmaltz. What is the point of all this? Fleming will continue to make a good living and I will no longer feel like there is something wrong with me for not wanting to listen to her sing. Next Article Long Live the Surtitle! I have been trying to find the words to describe how I feel about Fleming for months, since my boyfriend discovered her and started liking her! Your description is excellent, and mirrors exactly what I feel about her singing! That said, I really admire that formidable technique of hers… it’s all braun and I’m afraid little ‘brain’… but impressive and inspiring nonetheless. Anyway, thanks for your article, it’s always great to know there are good, decent, like-minded souls out there. I understand your point Susan, but I am not sure I agree. I was just in Belgium and we saw a Martha Stewart episode with Fleming. I assume it was an old show because she was essentially plugging this book. At any rate, she sang Dank Sei Dir Herr (sp?) by Handel. I am not sure of the literal translation but when sung in English it is usually Thanks Be to Thee but she was again singing as if she was trying to seduce god, not thank him/her. It was kind of painfully comic. But, in the end it is all subjective and comes down to personal taste. I guess that's my point! I have seen Ms. Fleming perform in concert/recital on TV and I definitely think your criticism has merit. However, on the opera stage the over-emoting can be quite appropriate; and, in fact, from the balcony seats, the over-emoting is just what the doctor ordered. Finally, I'd be curious to know which singers you and others on this forum enjoy. As for me, I like Barbara Bonney's voice very much. It is so pure and like fine crystal. I've also fallen for the voice of Magdelena Kozena, and I think that the late Lorraine Hunt had a beautiful voice. In the opera hall, Ms. Fleming's voice is really top notch and Angela Ghorghiu looks and sounds quite lovely when she actually decides to show up for work, which BTW, is not very often. From days gone by, I enjoy the work of many singers. Two of my favorites are Joan Sutherland (minus the marbles in her mouth) and Leontyne Price. Susan: The more I think about your comments about the difference between the opera stage and the recital stage is probably more valid than I initially thought. I imagined some of her recordings recordings on stage if you will and you are right, they probably wouldn't be as jarring to me. I think I actually heard her do Der Rosenkavalier at Covent Garden. Is that even possible? It is terrible that I don't remember. As far as who readers of MyPorch may like singing wise, I think you and I may be the only people discussing that. This blog post gets lots of hits, but not many leave comments. And I love music gossip, so that is a little disappointing. Book lovers are much more apt to leave comments I find. At any rate, who do I like…I love Deborah Voight, but her true groove only really comes across in person I think. Her recordings don't really capture it all (maybe like Fleming?). And recently PBS played some Met gretest hits and they showed what I think was Leontyne Prices final performance and I was reminded of how phenomonal she was. For as much as she is lauded, I still don't think she gets enough credit. Big fan of Eileen Farrell, Sills and Horne I still find amazing. Arleen Auger, Gundula Janowitz and Margaret Price. Gosh none of these folks are still singing (or alive). And I hate to say it, but recently through the magic of iTunes, I came reaquainted myself with a few Kathleen Battle recordings. There is much about her technique that I think is horrible, but despite her many vocal tics she sure made some satisfying sounds with Christopher Parkening. I haven't really kept up with the new “stars” and I never seem to remember the names of the great but lesser known voices that I run across in regional opera houses. Those great voices that never recording contracts. I do like Susan Graham a lot (you are not she are you?). And I like Karita Matilla. So Susan what is your story. Just a passing interest in opera, or are you a singer yourself? I used to be a fiend about going to concerts and operas as often as possible, but my interest in recent years has really waned and I am not sure why.